Attention, baseball fans. 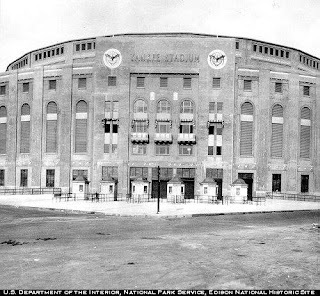 You probably haven’t yet read The House That Ruth Built: A New Stadium, the First Yankees Championship, and The Redemption of 1923. But, trust me, you should. You don’t have to love the Yankees to enjoy this book. Heck, you don’t even have to like them. This book is a vital addition to your library if you like baseball, though. I can’t say enough about the importance of this book. It’s like a slice of history — the birth of the Yankees dynasty, the birth of Yankee Stadium (which is, indeed, a story unto itself), and a peek at life when something as simple and pure as baseball defined an era. You know, when Cracker Jacks cost a nickel…and a bottle of soda was 15 cents. When tickets ranged from $1 (for bleacher seats) to a whopping $3.50. Ushers wore tuxedos that year, the year that Babe Ruth changed the Yankees, changed baseball, and changed the course of his career. The House That Ruth Built is a book that is easy to devour (in spite of being almost 400 pages)…but I found myself reading it slowly. In fact, I even re-read some portions because they were just so magical. Robert Weintraub has done a remarkable job with this book; he has truly captured every aspect of life in 1923 to paint an accurate and vibrant picture for his readers. I cannot recommend this book enough; you will be the hero on Father’s Day if this is your gift choice! You can snag a copy of The House That Ruth Built on Amazon ! I was not compensated for writing this post. I received a copy of The House That Ruth Built for my review. This post contains an affiliate link. My opinions are honest. This sounds like it would be a really good book. This would be a great gift for a baseball fan or someone who enjoys historical books. Thanks for the review! Sounds like a great book! I would love to read this book. It seems like it would be an interesting read plus it is a part of history. Thank you so much for sharing this review.